The Green Carbon Fibre website. is aimed at composite companies that are looking to recycle their carbon firbe scrap. The website offers a guide to the forms of scrap that can be taken – dry fibre (bobbins, fabric rolls or selvedges), prepreg (cured or uncured, rolls or processing off-cuts), or laminate (moulds, end-of-life components). 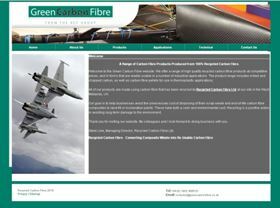 www.greencarbonfibre.com is aimed at companies, often outside of the composites industry, looking to use the Green Carbon Fibre range of 100% recycled carbon fibre products, which include milled and chopped carbon, as well as carbon fibre pellets for use in thermoplastic applications. The RCF Group operates the world’s first commercial-scale continuous carbon fibre recycling plant from its site at Coseley in the UK. The site is licensed by the UK Environmental Agency and has the capacity to process 2000 tonnes of scrap waste carbon fibre composite each year. The group is also active in the USA through Recycled Carbon Fibre USA Inc and plans to have a US plant operational in 2011. In the meantime, feedstock materials are collected in the USA and processed at the UK facility.